discover and creat the code, seasons is the focus of this activity. 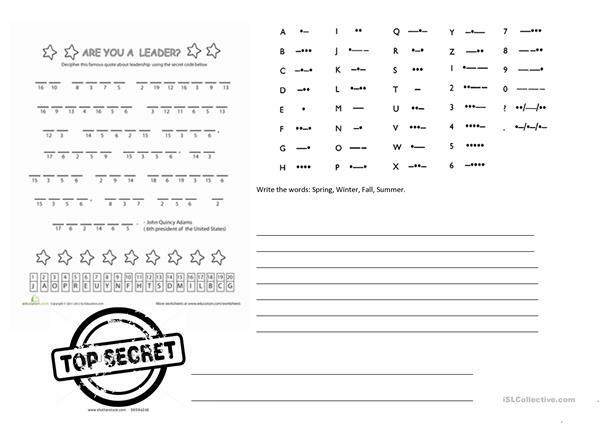 first find out the message and after write the seasons using the code.Please describe your worksheet with the students and make questios about the weather. The present downloadable handout is recommended for elementary school students at Elementary (A1) level. It is great for teaching Questions: WH questions (open-ended questions) in English, and can be used for developing your class' Listening, Spelling, Speaking, Reading and Writing skills. It features the topic and words of Seasons. breaklandia is from/lives in Portugal and has been a member of iSLCollective since 2015-04-11 04:43:07. breaklandia last logged in on 2015-04-11 04:43:08, and has shared 1 resources on iSLCollective so far.